It's 151 years since Alice's Adventures in Wonderland exploded into the public consciousness and its popularity shows no signs of diminishing. Alice is everywhere - popping up in various forms on screen and stage, referenced in politics, science, music, fashion, mathematics, comics and videogames. Given her frequent changes in size, this malleability is all too appropriate - Alice able to translate to damn near any medium mankind can invent. Pandemonium Performance's Alice in Wonderland is a fairly straightforward, Victorian tinged adaptation that hews pretty closely to the original text. A promenade piece presented as a series of vignettes, we follow Alice as she encounters all the familiar favourites, ending with her capital trial in front of the bloodthirsty Red Queen. So far, so typically Alice. What sets this production apart from the rest is the scenery. Abney Park Cemetery is one of London's secret treasures: a real-life Wonderland tucked away in Stoke Newington. One of the 'magnificent seven' cemeteries of the 1830s and 40s, Abney Park is a garden of the dead, populated by morose and mossy angels and the mouldering skeletons of Londoners past. Setting Alice here is an instant winner, a brilliant realisation of the dreamily surreal qualities of Carroll's story. Here, Tweedle Dum and Tweedle Dee battle atop crumbling graves; the Caterpillar puffs leisurely from atop a music hall performers last memorial and the Mad Hatter's table is a flat tomb-top. The omnipresence of death gives proceedings an appropriately gothic tinge, something played up when Alice asks a shy eight year old "who lives here? ", receiving the response "dead people", to which she reacts with mock horror. This Alice would squeak into 'success' purely through location, but the performances cement its quality. Interestingly, the show is divided into two halves, red and black. Each mirrored half has its own cast and locations, though we begin as one and eventually meet for the finale. 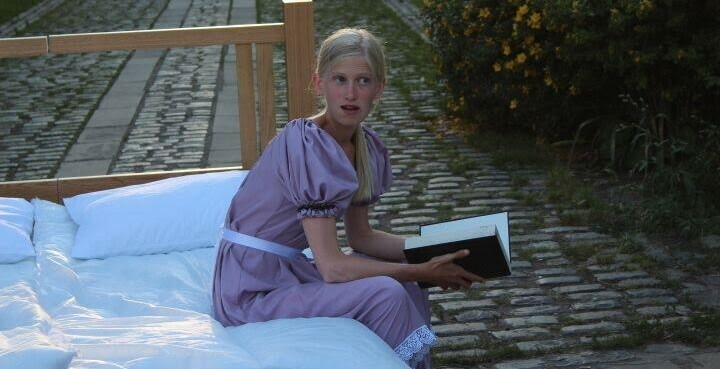 I was on the black side, with Nell Hardy as Alice. Accompanying her were Sara Lynam, Caitlin McMillan, Steve Fitzgerald and Luke Willats, all of whom cycle rapidly between roles, sometimes even within scenes. The five bristle with talent, clearly delineating their roles and tiptoeing the line between funny and scary. Particular praise must go to Fitzgerald's Cheshire Cat - the performer's toothy grin and skinny build is a perfect fit for the character, not to mention his faintly feral mannerisms and vocalisms. Also excellent is Lynam's homicidally imperious Red Queen, her performance precisely tuned to underline her haughtiness, joy in power and cracked regality. It's a cavalcade of excellence, but sitting at the top is Nell Hardy's Alice. Bone-skinny, with piercing eyes and calculatedly angular body language. She's believably child-like in her reactions, her unvarnished snorts of laughter and indignant reactions to illogical weirdness. But beneath that you sense something wild, untameable and powerful in her, despite the parade bizarre nightmare figures, we come to see the little girl Alice as the most dangerous creature in Wonderland. It's a hell of a performance in a hell of a show, one clearly enjoyed by adults and children alike. Setting Alice in Abney Park just feels right - though the story has aged beautifully, the characters are at home surrounded the graves of the Victorian dead. 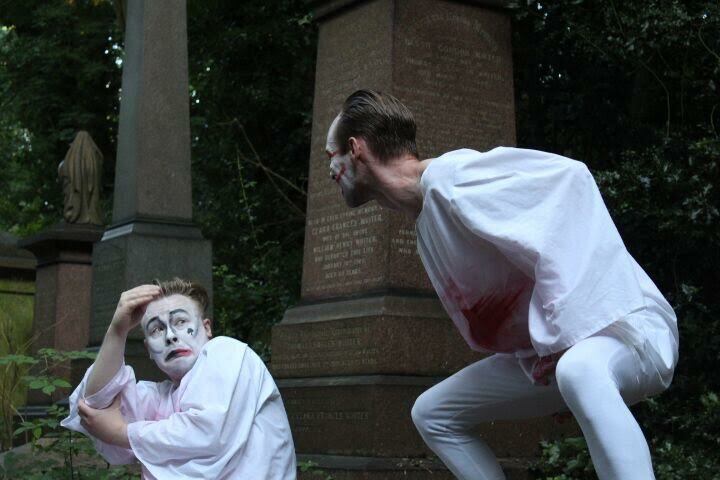 Pandemonium Productions have tapped into a wellspring of historical, psychological atmosphere, not to mention the sheer aesthetic beauty of the Abney Park setting. In these roasting days, when the sun dips lazily in the sky things become woozily indistinct,. It's the perfect time for Alice. Check it out! Alice in Wonderland is at Abney Park until 31 July. Tickets here.